While the storm blows around the house, I'm ensconced in my studio working on my fiber art. It only started to pick up around noon, but I hear that it is pretty bad in other parts of the maritimes. I spoke with my daughter in Charlottetown and she told that everything there is closed including her university. Yippee, snow day. Oh, My husband just called to say he's on his way-- a bit early. 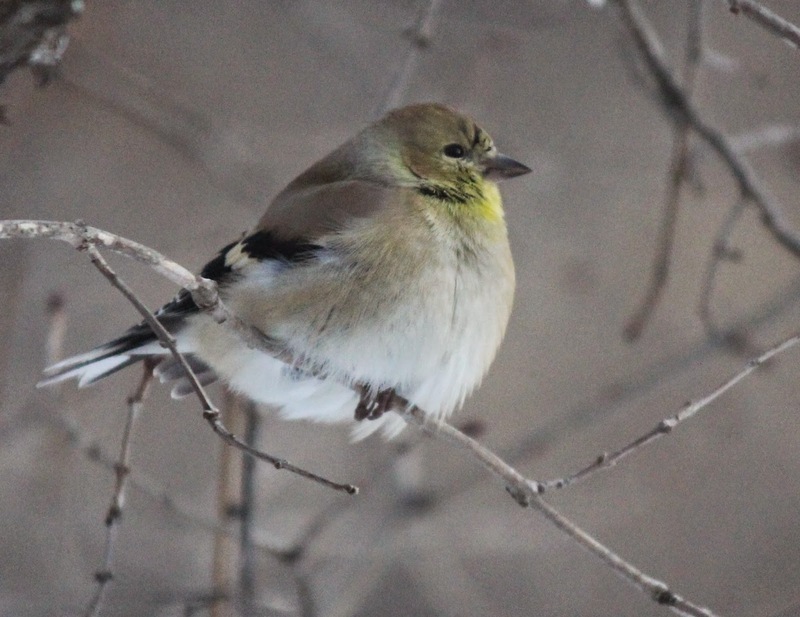 The birds were out to my feeders amidst the snow and wind, sometimes hunkering down in the nearby trees. I finished up the fish shanties by adding a binding. It measures about 4 1/4" by 6 1/2". It is for sale. $65. Email if you're interested. I'm still picking away at my hillside piece; I will be for a while. I am happy about seeing my vision finally starting to emerge, so maybe I'll move faster. I'm cutting trees with fusible on the back and playing with the layout. I'm almost ready to fuse it all together. I can't wait to get to the foreground stitching. I did a bit of free motion stitching on the background in grayed colors and not too much detail, as I want it to stay in the background. While it's a beautiful, sunny winter day here today, tomorrow will be a different story. The storm that is coming up the eastern seaboard is slated to hit here as well. I didn't go for a walk though, as it is quite windy and I spent a good deal of my morning getting my cleaning chores done. I've got my sheets hanging on the line. Am I crazy to find this a pretty sight? I've added more flowers to my pendant light. I like the look and it effectively softens the light in that corner. After lunch, I sat down at my machine and had fun with some thread painting. There are a few little things that I'm not quite satisfied with but I will let it rest for today.. When I'm sitting at my machine, I can watch the little birds at the finch feeder and in the adjacent lilac tree. I like to keep the camera handy. Sometimes it's hard to focus on my stitching! I'm editing this to say it is a pine siskin. Well, that's my Monday. Oh yes, I already made a half sized blueberry crumble which I plan to have for dinner along with salmon and beet greens. Now it's time for tea. I hope you're all having a good Monday. 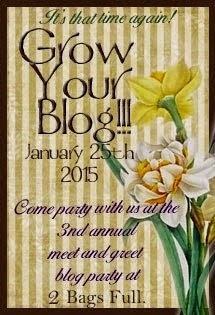 Today, I'm participating in the 3rd annual Grow Your Blog Party hosted by Vicki at 2 Bags Full where you will find a long list of participating blogs. Perhaps you'll find some new friends and some interesting reading. It is a very large undertaking that she does once a year and I'd like to thank her. My name is Holly McLean and I live in a very small city in northern New Brunswick, Canada. I started blogging about 6 years ago when, after having read blogs for a while, I thought it might be a way for me to journal about my own journey and to connect with like minded bloggers. I left work almost 5 years ago due to illness and since then my art and my blog have become real lifesavers for me. I have not only found new and wonderful blog friends, but I've also been published in Quilting Arts magazine, something very exciting for me. You never know what you might read about on any given day with me. I like to post about recipes I find or create, my knitting and craft endeavors, the garden, my drawings, birds at my feeders or on my walks, photographs of my walks, my fiber art and sometimes some traditional quilting or sewing. 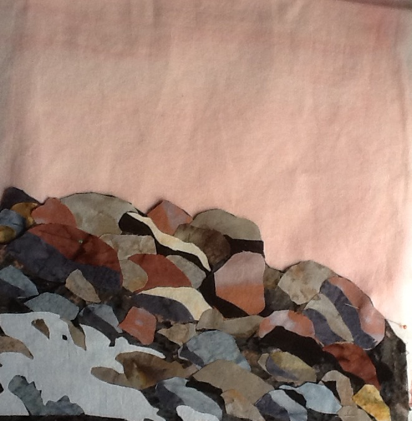 I've been working on a piece based on a photo of a rocky hillside a few minutes from my home. It is one of the most complicated pieces I've done. Yesterday, after my errands and household jobs, I finally backed the painted sky with some stabilizer and sat down to free motion stitch some background trees. I was so tired by then that I had to quit but at least now I can sit down to it at any time. One of the chores I was doing yesterday, was organizing some of my thread so I can better see what I have. Most of the greys and a lot of the greens are missing as they are in a tray next to my machine for my current project. I've also chosen a matching batik for a little (4 !/2" by 6 !/2") piece that I'm doing of some local fish shanties.I may use it as a binding. I don't think it will need anything more. On the trail yesterday with my husband, we gathered a few more branches for my feeder area on my deck. At Christmas I made two sprays for opposite posts on the deck. I view these from our kitchen and dining room windows and liked them so much, I wanted to add a 3rd one in the middle. We put another suet cage there as well. The chickadees, woodpeckers and nuthatches love them. One other creative thing I'm up to is to embellish a light that I recently had my husband put up in a corner of the living room. I loved the style but the clear glass allows too much of a glare even when we bought a soft light. I picked up a package of stick on plastic flowers form the Dollar Store that I planned to use for something else when the idea struck me to try them out on the lamp. I think I like it and plan to cover the whole thing. Perhaps, I've seen some similar ones in design magazines. I hope you enjoy the reading you'll find on the blog party and that you make some new connections and new friends. I intend to check it out myself later today. I know the title doesn't sound much like I'm paying attention to my word for the year and staying 'focused'! However, my interpretation of the word means that I want to focus more on the moment, trying to be present when I'm creating (that's easy), when I'm eating or exercising, or basically doing anything. No more burnt pots! I started the day intending to paint the trees onto my newly painted sky for the rocky hillside piece. 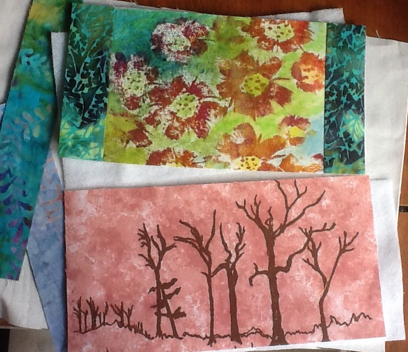 I did go into the studio this morning and cut out pieces for the background hillside and some of the snow. I like to draw my pattern onto freezer paper which I then iron onto the right of my fabric which has fusible already ironed to the back. This way I don't have to worry about reversed pattern pieces and I can see how it's going to fit as I go along. I've laid it out with some of the pieces of the snow on the shrubby hillside part with the sky fabric in behind. I did not paint the trees onto the background fabric after lunch because I wandered into my studio with my cup of tea and got lured to the sewing machine. That is the joy of having a studio where you can leve everything set up. Everything is sitting there waiting (calling) to you. I added some fir trees to the background of my little shanties piece. My thought at the time was that I'd just add some firs and then I'd go paint on my other piece. Of course I kept pulling out more thread colors and one tree led to another. I finally had to stop for my afternoon snack. I had pomegranate with cottage cheese, my favorite! I'll make a cup of tea now and go sit down in my new happy place with my knitting and a bit of Downton Abbey. I've set out one of the new cushions that I finished even though I find the pillow form a little too full. I'm going to open it and take out some of the stuffing. You might notice that I've tried out a bound edge just like on a quilt-- an idea I came across somewhere on the net. Now, for my cup of tea before dinner preparations. This is what happens to me, and I know it happens to you sometimes too! I have a couple (putting it mildly) of projects that I'm working, on but the muse is calling me to do something new. Yesterday, I posted a sketch of the fish shanties which I photographed last week on the river ice near here. The images were floating around in my mind as I got the mundane housework and washing out of the way this morning. Oh, and there is a chicken roasting. I rationalize it my saying to myself that I have to go with the flow when the creative spirit hits. I'll do a tiny piece, completely opposite from the larger rock piece that I'm still working on. So, I traced my drawing onto white cotton fabric and laid on a quick wash using Neocolor II crayons. I couldn't wait and used the hair drier and then the iron to dry it. After I cut a piece of stiff interfacing to stabilize it, I started adding a few stitching lines. I've accomplished a lot today. Clothes are washed and hanging on my rack in the laundry room--my effort to lower the power bill--and I just took the chicken from the oven. I feel like time is slipping by even as I'm aware of being focused in my artwork. When I 'come to' and realize how much time has passed, I'm amazed. It has been a satisfying Monday so far. I have to stop now for my tea and I'm going to sit and stitch back the binding on one of my cushions. It's been a rather quiet weekend with a guild sewing day yesterday, breakfast and the paper with hubby this morning, visiting in laws after lunch today, and a bit of sketching this afternoon. I'm still working on my sofa cushions. I've got one together but ran out of Velcro for the second one. My mother in law gave me some today, so I'll be able to finish them. I've got several doctor's appointments this week, including one for some dental work. I'm hoping for some time in between. You'd think January would be a quieter month but I put off some things from before Christmas. Also, our retreat is coming up in early February. Between the secret sisters thing and some birthdays, I've had to do some sewing for 'gifty' things. I joined this group for sock knitting on Facebook and that has got me madly knitting as well. I'm making a pair of socks from a vintage pattern with a single cable up each side. I know that a solid color is usually recommended for cable work, but I was so in love with this color and hoped that the fairly monochromatic colors would show the cable. I think it does. I feel a bit as though I've not been doing a good job at staying focused this month with so many things to do. I realized that I haven't been doing the sketching that I did in the summer and fall. It is meditative and helps me to slow down and relax, so I thought it was just the thing with a cup of almond milk hot cocoa this afternoon. It is the time of year for the fish shanties. I love to photograph and sketch them. What is it about those temporary little villages that spring up out on the ice that so fascinate me? Each year, the colors and configurations are different. They are fun to try to capture and I love it when I get a few of the fishermen. Here they were having a bit of a chat. I grabbed my sketch book and my colored pencils for a bit of a quick study based on one of the photos I took last weekend. I will do a few of these I think when I feel the need. Last year, I did two pieces in fiber. Well, I must stop and go get my supper going. I hope you've had a nice weekend. We awakened to -28C temperatures this morning with beautiful crisp wintry blue skies. It has been one of those wondrous winter days with the temperatures gradually warming to -11C this afternoon. Oh, over the last couple of weeks, how I've discovered that an aging menopausal woman does not do well with disruptions and change, albeit small ones such as we've had. At yoga this morning, I finally felt a sense of peace, breathing deeply and stretching. when I returned and entered the front door, the warmth of my living room with the focus wall (there's my word of the year again)and its new paint color and the recycled furniture from the rec room is now finally welcoming to me. It'll be even better once Ive put up some of my artwork. The green and the taupe/plum color sing to me. Yesterday, at my sewing day, I finished the two little zippered pouches. The pattern is Bridgets's Bagetttes by Atkinson Designs. I forgot to take a picture of the first one which I gave to a friend as a birthday gift at lunch today. The inside. One of my prints. After lunch, the trail was calling to me, but so was my current fiber art piece. I took the time to paint some of the background for my rocks. I'm not completely satisfied with it; however, I'm still happy. I think I'll do another one and leave more sky showing through. I'm happy because it was a fun process and I know how I want it to be. A perfect end to my afternoon-- getting out on the trail. They are quite well trodden and with poles for support, fairly good under foot. So many things to be happy about today. is it any wonder that I'm continually captivated by birch trees? I leaned a little heavily on the poles to get home. I will need an ice pack later. A fair trade for a lovely day. If you've been reading my posts, you'll know that it's been a bit of a shaky start to the year. Nearly causing a fire and stinking up the house, having a contractor run a noisy air cleaner for a few days, getting a broken windshield in the car, and then waking up on Saturday morning with a raging bladder infection have not contributed to a great couple of weeks. Still, I must look on the bright side. It was all nothing major and can all be fixed. We think there may still be a bit of a smell, but for now we're living with and plan to paint and clean a bit more, hoping eventually we'll get rid of it. I am not up to anymore disruption right now. I woke up in my cozy bed this morning --a little later than I wanted but I made up for it. I got a multi-grain bread started and set it to raise in the oven, vacuumed and did the wash.
At lunch time, I baked the bread and made bok choy ginger soup for dinner. I simply had to try the heel with molasses. Do you do that? It's my favorite. I'm going to need some restraint! After lunch, the furniture store delivered our new side by side lazy boys which went down into the rec room. They brought up the rest of the sectional for us to the living room. The color is right, but I'm not sure I really like it. The hide a bed section is not that comfortable to sit on. I may replace this too. I haven't committed to hanging any pictures yet. Perhaps I should wait until I've decided on the furniture. Here is my latest pic of a visitor to my deck feeders. Finally, after I got the furniture all straightened out, I could go into my studio for a bit of free motion stitching with black thread, the first free motioning for the New Year. I just wanted to add a bit of definition to the prints that I'm using in the zippered pouches. They will show through the vinyl fronts. The section on top has the zippers already sewn in and ready to attach to the backing prints. I'm getting organized for a sewing day at a friend's house tomorrow where I hope to finish these. I also laid out my painted sky behind the appliqued rocks and taped it to my window. A simple light box which I use often. Last year, I did a couple of fiber art pieces based on them. I hope I'll have time this year. It's like a little village to the fishermen. Having driven hubby to work this morning, I have the car for the day. I went to my 9:30 AM yoga class and afterwards, I went looking for a piece of grey fabric to use as a binding on my pillows. Then I went to The Book Gallery, a local independent book store, where I had a bowl of corn chowder with a biscuit. I sat basking like a cat in a sunny window all the while doing a bit of knitting as I spooned in the soup. In my studio this afternoon, I've been puttering a bit, going through some of my discarded and left over bits of screen printed fabrics, looking for something that I could use to make a couple of zippered pouches with the vinyl fronts. I've cut the pieces to make two pouches. They're a bit labor intensive as I want to do a small bit of free motion stitching on the screen prints, but that is the fun part for me. Also, I like being able to use pieces that I've previously set aside as not quite good enough for a larger piece. The only other thing I did was to lay out my rocks against the piece of fabric that I painted. I think the color is OK. Bear in mind that I will need to add some shrubbery and some trees to the background and it will not end up looking so peachy. I think I'll paint another piece too just to have some choice. I'm so anxious to get the background elements on and get to the stitching part. I've just eaten a half an apple with nuts while writing this. I'm off now to make a tea before I have to go back to pick up hubby. The huge noisy fan and air cleaner has been running for just over 24 hours and I'm getting a bit used to it at least. Some of you will know about my near disaster with a pot left on the stove. Miraculously, there was no fire but there is a lingering burnt smell that the cleaning and washing didn't alleviate. Because of the noise we've not been able to use the living room or eat in the dining area. We are lucky to have a rec room in the basement to go to. I think we'll have it for the week and then have to reassess for smell at that time. If it doesn't work the contractor will come in to clean and paint. Fingers crossed. This is my living room with the new wall color behind the sofa. We moved one half of the sectional up from the rec room but we'll need help for the second part. We'll wait as we'll delay delivery of the new piece that we bought for downstairs until the smell is gone. The dining area appears to be a fairly brighter green than it really is.. It is actually not quite as limey as shown here. It must be the bright sunshine coming in the sliding doors. I've spent most of the day in my sewing studio. Despite the sun, it's bitterly cold here; no walk today. I am one to bundle up no matter the temperature but the wind stopped me today. Finally, I painted a piece of fabric for the sky on my rocky hill. I know it always dries lighter than the wet paint appears, so I painted it a bit darker than I wanted. It is still wet in the picture and has actually dried a little lighter than I'd hoped. It may be OK as the sky is really pale in the reference photo. Maybe I'll do another one to choose from; it can always be used in another piece. I also sewed together the second pillow top and then got them both sandwiched and ready for some minimal machine quilting following the grid of squares. Lastly, I've another 'birdy' photo for you. Well, two actually. It's hard to believe such little things can survive this cold. They seem to be conferring here. The temperature was about -27C at the time. Perhaps they ere complaining. Quite amazing how their brilliant yellow fades in winter to beautiful soft greys and black with a tiny spot of pale yellow. They are quite camouflaged. The speck of yellow almost seems to be a trick of the sunlight.